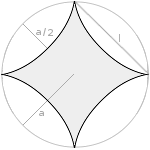 Calculations at an astroid, a hypocycloid with four cusps. An astroid is the path of a circle with the radius a/4 (diameter = a/2) inside another circle with the radius a. Enter one value and choose the number of decimal places. Then click Calculate.